To support this feature of clumping and layering, trees planted for profit are also planted in clumps of the same species. The number of trees in the forestry clumps being proportional to the overall number of plants in the biorich plantation. At the Ballarat Region Treegrowers demonstration biorich plantation at Lal Lal's (called ImLal) southern revegetation site, 10% of the revegetation was planted with trees for profit. Form Pruning - why, what and when? Form pruning forestry trees is a management practice that adds value to trees and plantations. Form pruning is the removing small side branches to improve the market quality and value of the wood in the trunk of the tree. It is a labour intensive process using secateurs, hand held loppers and manual or mechanical pruning saws. Pruning usually starts in the second and third year after planting. However it can start on multi trunked trees after one year, with the removal of competing trunks (bifurcating & trifurcating limbs) to leave one straight trunk. In the following years the side branches are removed annually or biannually, eventually producing mature canopy trees with straight trunks without branching up to 12 m from the ground. The longer the straight trunk, the higher the potential market value of the saw log when harvested. ​for improved healthier growth of the trees grown for profit. These weaker trees are likely to die out within 5 years. If they continue to grow they will later be removed, ringbarked or poisoned to reduce competition for the selected form pruned trees. Ringbarking or poisoning instead of removal, is a preferred option because keeps the shrub layer and its benefits intact for many years longer. Even though it is only in its skeletal form it still provides effective habitat, roosting and perching sites in a protected and safe environment. Selected indigenous canopy trees planted in a biorich plantation can also be form pruned for profit. In the biorich system, canopy trees are planted in small clumps at a spacing that mimics the spacing of mature canopy trees in the appropriate Ecological Vegetation Class (EVC). For example if the local EVC is Plains Grassy Woodland, then the expected spacing between canopy trees (and therefore the clumps) would be 20 - 30 metres compared to a Grassy Forest with an expected closer spacing of 15 - 25 metres. At ImLal the indigenous canopy trees were planted at 25 metres spacing in clumps of five trees. This allows for some natural selection with the stronger trees becoming dominant and the weaker trees dying out. 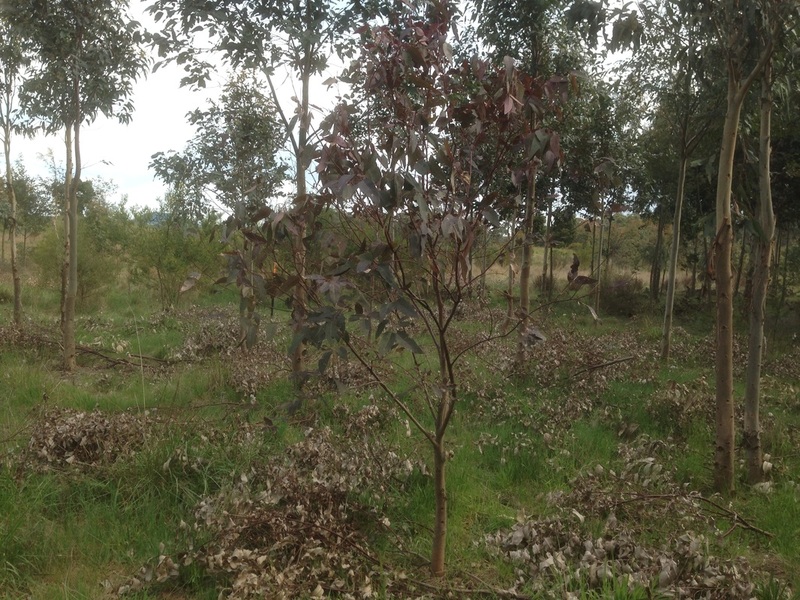 Even though Swamp Gum, Eucalyptus ovata doesn't have a recognised commercial value, one of the vigorous, straight Swamp Gums within the clump of five trees, was form pruned to demonstrate the method and its possibilities. Blackwood, Acacia melanoxylon is a local species that is germinating naturally at ImLal. This species has a significant commercial value for cabinet making, so it was decided that some of the vigorous, straight Blackwoods would also be form pruned to provide a future income from the biorich plantation. In the early years of the development of a biorich plantation the clumps of indigenous canopy trees can provide important shrubby habitat for wildlife. Young canopy trees like Swamp Gum are dense and leafy and look like a small shrub. Whereas other eucalypts like young Ironbark, Eucaluptus sideroxylon are tall and slender with a more open permeable habit like an open tall shrub. Therefore the natural forms of unpruned indigenous canopy trees serve the important function of providing shrub and understorey habitat in the early years of a biorich plantation. This fills a time gap while the indigenous shrub and understorey species grow to a suitable size and structure to support the small birds that naturally feed and nest in these layers. Regeneration of trees and shrubs will happen naturally near remnant vegetation, if grazing animals are removed. Managed grazing with long periods between stock access (several months for grassland plants and at least a year for trees and shrubs) will also result in natural regeneration as long as the periods of grazing are short (days not weeks) and timed to allow plants to set seed. The plant species that regenerate are usually the same species as the mature plants in the nearby remnant vegetation. There can also germination from the long lived seed of other plants like acacias that is stored in the soil. Natural regeneration can initially be dominated by just a few species. These are usually acacias and eucalypts but can also be other pioneer plants like cassinia, casuarina, dodonaea and many of the pea bearing species (Fabaceae family). Natural regeneration often forms dense thickets within 30 m of the remnant vegetation and because they germinate over a few years, the plants are frequently of different ages and sizes. In the early years after regeneration this size difference is important as it adds structural layering to the emerging woodland or forest which benefits wildlife, even though the layers may be provided by only one or two species. 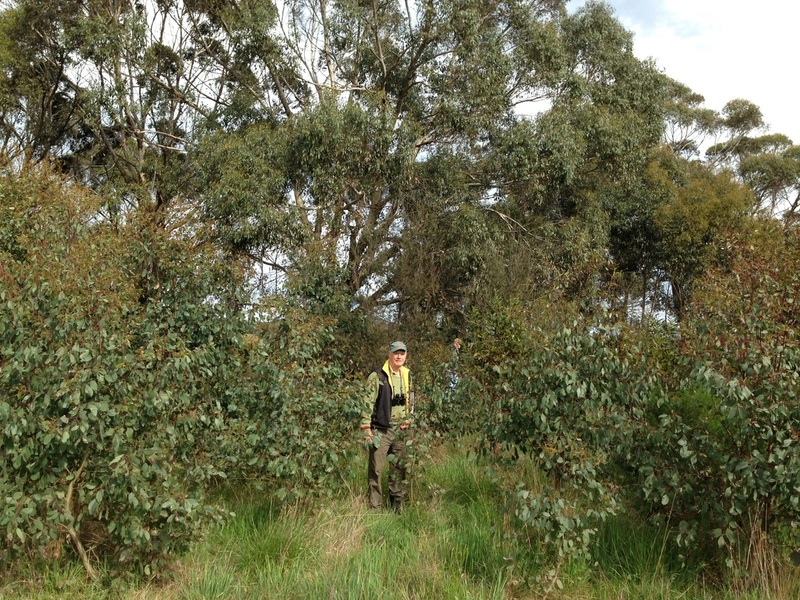 At ImLal at the southern biorich demonstration site, Swamp Gums are regenerating in dense lines within 30 m of the western boundary road reserve. These Swamp Gums are bushy and vary in height from 3-5 m (three years old) to just 1 m. Within 20 meters of these regenerating trees are mature 100 + year old Swamp Gums with hollows. The Swamp Gums as a group are therefore providing the canopy (with hollows), the understorey layer (3 yr old trees) and the small shrub layer (1 - 2 m tall younger trees). To insects and birds this is invaluable habitat and it is a location where birds and insects are often observed during the bimonthly bird surveys at ImLal. Thinning the dense thickets that have grown from natural regeneration can benefit a plantation, by assisting the re-emergence of a greater diversity of plant species. In the early years wild life will benefit from the density and age differences of the natural regeneration as was discussed above, however after a decade or so, because of competition for light and soil moisture, lower branches on the young trees will wither and the weaker trees will die. This natural process results in the loss the shrub and understorey layers with only the canopy and ground layer remaining intact. If left to nature, the emerging eucalypt woodland will naturally thin back to an average of one tree every 20 - 30 metres, a process that is likely to take a century or more. Other plant species will appear during this long process to add more diversity. Manual thinning in the latter part of the first decade will hasten this evolution to more diversity. 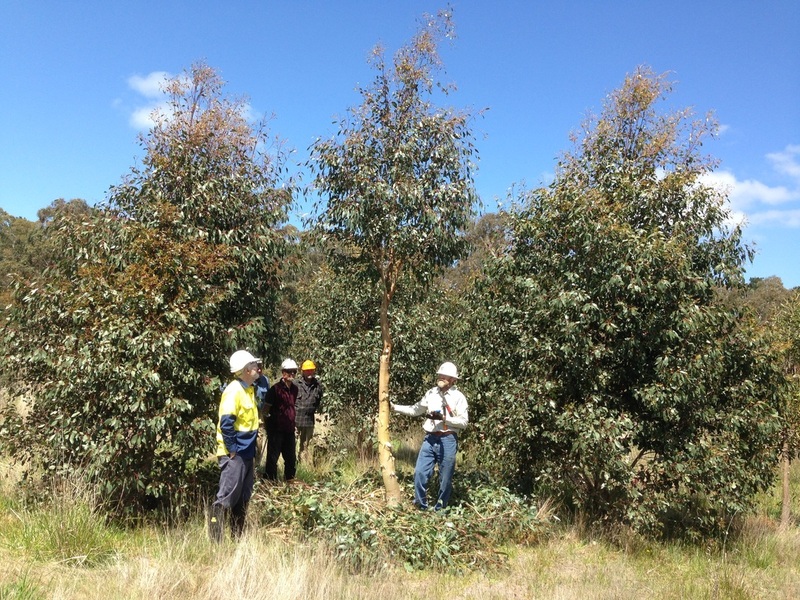 The recommended method involves thinning eucalypts to clumps of 5 - 10 healthy trees (leaving the weaker trees to die provides layering and perches within the clumps) and leaving a space between these clumps that mimics the local EVC canopy tree spacing - usually 20 - 30 metres. It creates inter clump spaces where other local species can invade providing added species diversity. This can be encouraged with disturbance through cool burning and/or shallow ripping. Additional species can also be planted as tubestock or seed to provide suitable shrub and understorey between the canopy tree clumps. 2. It allows the process of natural selection to continue in the clumps, leaving the dominant trees surviving into the next century. Further removal of trees within these clumps for timber resources could be done in future decades while being mindful of the natural selection process. Therefore it is importance to leave the stronger trees that would have naturally become the dominant survivors to follow natures process of allowing the fittest and strongest of a species to pass its genetically superior traits to the next generation . It's full of information and opportunities to get involved in field days or learning about forest tree management. There is a 'Mentor Program' run through the Otway Agroforestry Network (OAN) that provides free support and advice to members. ​The Master Treegrowers Program has been running since 1996 and provides a short practical course over several weeks covering species selection, tree management to produce quality timber and marketing ideas. It includes site visits to see what other people are developing their agroforestry projects. Here is a link to 'practical info' on his website.